According to NASA, powder from a rock found on Mars indicates the Red Planet may have been able to support microbes billions of years ago. NBC's Katie Wall reports. Powder drilled out of a rock on Mars contains the best evidence yet that the Red Planet could have supported living microbes billions of years ago, the team behind NASA's Curiosity rover said Tuesday. "I think this is probably the only definitively habitable environment that we have described and recorded," said David Blake, a scientist at NASA's Ames Research Center who is the principal investigator for Curiosity's CheMin lab. The findings are in line with what the scientists hoped to find when they sent the 1-ton, six-wheeled laboratory to Mars' Gale Crater. "It wasn't serendipity that got us here. It was the result of planning," Caltech's John Grotzinger, the $2.5 billion mission's project scientist, told reporters at NASA Headquarters in Washington on Tuesday. Serendipity did, however, play a part in being able to find the evidence so soon, he said. Curiosity's handlers had planned to have the rover head for a 3-mile-high (5-kilometer-high) mountain in the middle of the crater. But when the rover landed, the science team decided to send Curiosity on a detour to a geologically interesting area in the opposite direction, nicknamed Yellowknife Bay. Preliminary readings showed that the area had been a riverbed or lake bed in ancient times. Last month, the rover finally got a chance to drill into a Martian rock that was named John Klein, after a member of the mission team who died in 2011. 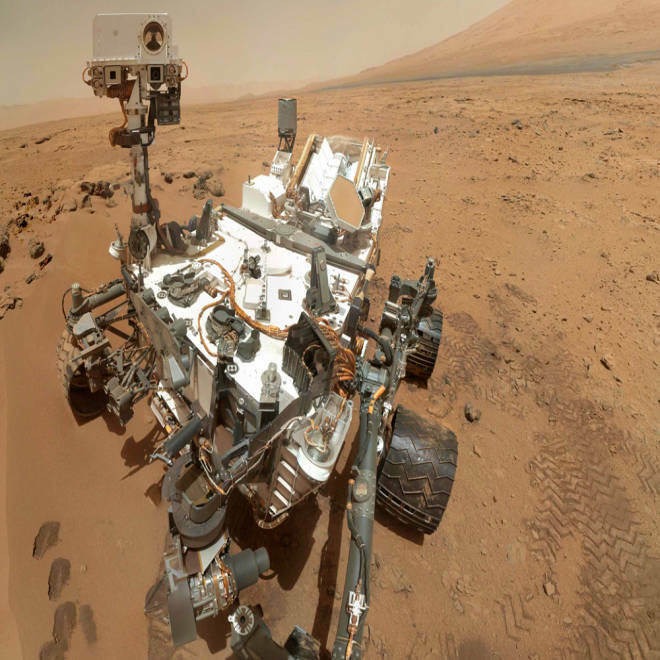 Curiosity fed tablespoons of the ground-up gray powder into its two onboard chemical labs: CheMin (Chemistry and Mineralogy) and SAM (Sample Analysis at Mars). The results were announced at Tuesday's news briefing. Scientists said the powder contained the elemental ingredients of life — including sulfur, nitrogen, hydrogen, oxygen, phosphorus and carbon. More significantly, they found that clay minerals made up at least 20 percent of the sample. On Earth, these clays are produced when relatively fresh water reacts with igneous minerals such as olivine. The scientists also found calcium sulfate, which suggested that the water had a neutral or mildly alkaline balance. Earlier NASA missions had found evidence that salty, acidic water was once present on Mars, but that extreme environment would have been challenging for today's Earth-type organisms. Curiosity's chemical analysis produced a different result: The water that was available during the formation of the rock at Yellowknife Bay, billions of years ago, could have supported the kind of life commonly found on Earth. "We have found a habitable environment which is so benign and supportive of life that probably if this water was around, and you had been on the planet, you would have been able to drink it," Grotzinger said. A side-by-side comparison shows the X-ray diffraction patterns of two samples collected by Curiosity. The left side shows data from a sample collected from a drift of windblown dust, and the right side shows data from the powder drilled out of the John Klein rock. The John Klein readings show an abundance of phyllosilicate, a class of clay minerals called smectites that form by the action of relatively pure and neutral pH water on minerals. The left image shows Wopmay rock in Endurance Crater, as studied by NASA's Opportunity rover. The right image shows Sheepbed in Yellowknife Bay, as studied by Curiosity. Scientists say both rocks were formed in the presence of water, but the water at Wopnay was highly acidic and salty, while the water at Sheepbed had a more neutral pH and lower salinity. The scientists said they were surprised to find a mixture of oxidized and non-oxidized chemicals, allowing for the type of chemistry that earthly microbes use to generate the energy they need for survival. This partial oxidation was first hinted at when the drill cuttings were revealed to be gray rather than red. "The range of chemical ingredients we have identified in the sample is impressive, and it suggests pairings such as sulfates and sulfides that indicate a possible chemical energy source for microorganisms," SAM principal investigator Paul Mahaffy said in a NASA news release. NASA said another drilled sample would be used to help confirm the chemical findings for several of the trace gases that were analyzed by the SAM instrument. The current plan calls for Curiosity to conduct experiments in the Yellowknife Bay for weeks or months longer, and then begin a roughly 6-mile (10-kilometer) drive to the big mountain, known as Mount Sharp or Aeolis Mons. Scientists will look for further evidence of ancient organic chemistry hidden in the mountain's many layers of rock. The primary aim of Curiosity's two-year primary mission is to find evidence of past habitability — in particular, organic carbon compounds that could have played a role in the chemistry of life billions of years ago. Grotzinger said Curiosity's scientists will focus on the systematic search for organic carbon now that they had "the issue of habitability in the bag." NASA intends to follow up on Curiosity's findings with future Mars missions, including the $500 million MAVEN orbiter (due for launch this year), the $425 million InSight drill-equipped lander (set for 2016 launch) and another Curiosity-like rover that's scheduled to be sent out in 2020.